In the wild, they feed upon fish, snails, amphibians, insects and worms and some vegetation. Shallow rainforest streams, pools and marshes. Platemys platycephala requires a large area of land as well as a shallow pool of water. They are at home as much on the land as they are in the water, so a significant amount of both is required. They prefer shallow, soft-bottomed habitats, with a lot of vegetation. Either artificial plants or aquatic plants that can withstand the low pH requirements are suggested. The substrate, if used, should be sand or a fine gravel. UVB lighting is required, as well as a heat lamp over the designated basking area. A submersible heater is also recommended. Recommended size for a single adult Platemys platycephala would be a 55 gallon aquarium as a minimum (75 or larger preferred). This will provide adequate swimming area and a good amount of land for the turtle to move about, as well as assisting the filtration in maintaining good water quality. For additional Platemys platycephala, I would recommend adding 30 gallons of tank space per additional turtle at a minimum. A longer and wider tank is preferred as they do not require deep water. In captivity, they do well on Mazuri and ReptoMin, Reptile/Pond 10, Cichlid Sticks, fish, crickets, assorted worms and insects, and some vegetables. 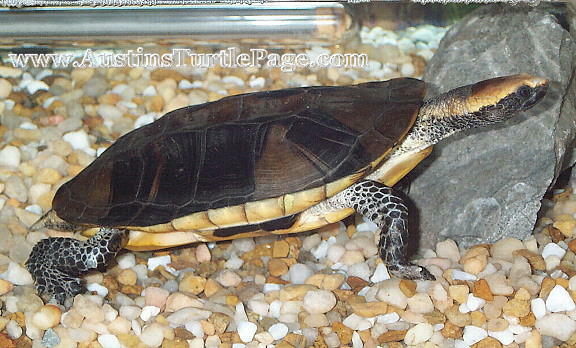 It is recommended that if they be kept in a community habitat, that the other turtles within the community have the same requirements of shallow water as well as being from the same region as the Platemys platycephala. Platemys platycephala are highly susceptible to fungal infections and close attention to their water conditions is a must. They are sociable turtles and will gladly accept food by hand.